LA JOLLA—Selective serotonin reuptake inhibitors (SSRIs) are the most commonly prescribed medication for major depressive disorder (MDD), yet scientists still do not understand why the treatment does not work in nearly thirty percent of patients with MDD. 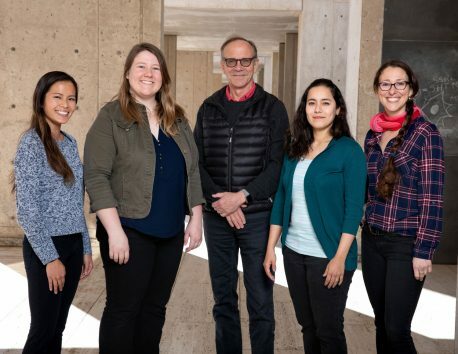 Now, Salk Institute researchers have discovered differences in growth patterns of neurons of SSRI-resistant patients. The work, published in Molecular Psychiatry on March 22, 2019, has implications for depression as well as other psychiatric conditions such as bipolar disorder and schizophrenia that likely also involve abnormalities of the serotonin system in the brain. Human serotonergic neuron projections (red) and cell bodies (green). From left: Amy Le, Kelly Heard, Rusty Gage, Krishna Vadodaria and Carol Marchetto. From a large-scale clinical study of 800 MDD patients, the researchers selected the most extreme cases of SSRI response—patients who drastically improved when taking SSRIs, and patients who saw no effect. 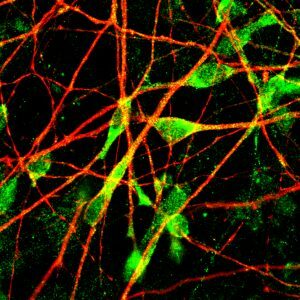 The team took skin samples from these patients and reprogrammed the cells into induced pluripotent stem cells (iPSCs) in order to create serotonergic neurons that they could study. This work was funded by the Robert and Mary Jane Engman Foundation, Lynn and Edward Streim, a Takeda-Sanford Consortium Innovation Alliance grant program (Takeda Pharmaceutical Company), the Swiss National Science Foundation (SNSF), the Minnesota Partnership Award for Biotechnology and Medical Genomics, the Mayo Clinic Center for Regenerative Medicine, the NIH-Mayo Clinic KL2 Mentored Career Development Award (NCAT UL1TR000135), the Gerstner Family Mayo Career Development Award in Individualized Medicine, and the National Institutes of Health (GM61388 PGRN and RO1 GM28157).